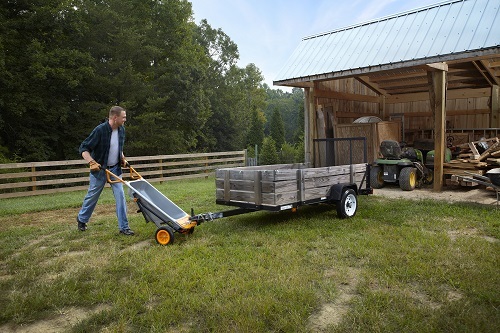 The new WORX Aerocart is a multi-purpose cart that can be used for dozens of moving projects around the house, yard or workplace. What makes this mobile cart unique is its dual-position wheels, which enable it to handle the work of eight carts. 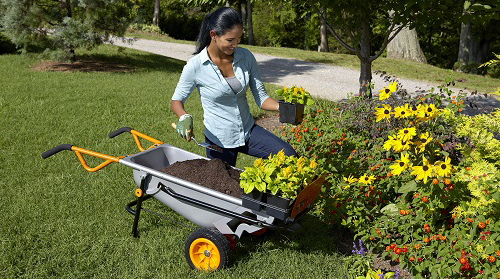 Fill the bed of a conventional wheelbarrow with dirt, stone or mulch and hold on tight because most single-wheel wheelbarrows tend to be tippy when maneuvering heavy loads. Not so with Aerocart, it exploits the physics of leverage. As a wheelbarrow, Aero- Cart’s tub is specially shaped to concentrate the center of gravity directly over the wheels. This creates a perfectly balanced load that’s lifted and moved with ease. Test results show that a 200 lb. load feels more like 17 lbs. Spring is officially here and one of the first lawn and garden projects is laying down mulch to amend the soil and help prevent weeds. Bulk or bagged mulch is easy to transport and unload with the Aerocart. The same is true when moving top soil around the yard to fill garden and vegetable beds, or at the base of shrubs and trees. The cart also is a handy demolition helper by moving debris away from the worksite. Aerocart’s 22 inch width allows it to fit easily through fence gates, front doors and patio doors. Aerocart’s dropdown extension arms convert the versatile cart into an extended dolly for moving bulky items such as bags of mulch, hay bales or furniture up to 80 lbs. Boulders in the landscape are great accents, but be careful when moving them because it can be backbreaking work. One of Aerocart’s accessories is a mesh sling rock holder. Roll the rock over the mesh sling. Once the sling cradles the rock, slip its steel rings onto the cart’s extended arms for transporting up to 80 lbs. Situating flower pots and large plants can be tricky because you don’t want to damage the plant or break the pot. The plant mover accessory balances and transports plant containers up to 80 lbs. and 15 in. diameter. The plant mover wraps around the container and secures it using a cinch strap. The accessory’s two steel rings at opposite ends loop over the cart’s extension arms for transport. When Aerocart is in dolly position, it’s a hand truck ready to move totes, boxes, furniture, and refrigerators up to 300 lbs. Cleaning up yard debris can be a challenge when using paper refuse bags because they don’t stay open. Aerocart’s bag folder solves the problem. The u-shaped bracket slips into the cart’s frame to hold the bag in place for loading. In many areas, fire pits are used year long. To transport wood, Aerocart provides two methods: load the wood in the cart’s tub or, for wood 22 in. or longer, drop down the extension arms to move the timbers. For transporting oversized water jugs and fuel tank cylinders, there’s a cylinder dolly v-shaped bracket that slips into the frame of the cart and serves as a brace to hold water jugs and tanks in place. To jockey trailers up to 1,000 lbs. attach a receiving ball hitch (1-7/8in. ; 2in., not included) to Aerocart’s faceplate. It helps position boat, personal watercraft, snowmobile, ATV and motorcycle trailers when not in use. Aerocart’s tubular steel, powder-coated frame and drop down extension arms are durable and long lasting. The frame wraps around the steel 3 cu. ft. capacity wheelbarrow tub. Two steel extension handles with foam-padded grips aid mobility. The handles are removable for transport and storage. Aerocart’s flat-free dependable 23.5 in. diameter, rubber composite tires maintain constant air pressure and never need inflating. Aerocart’s accessories include the Plant Mover Strap; Cylinder Holder; Bag Holder and Rock Holder. 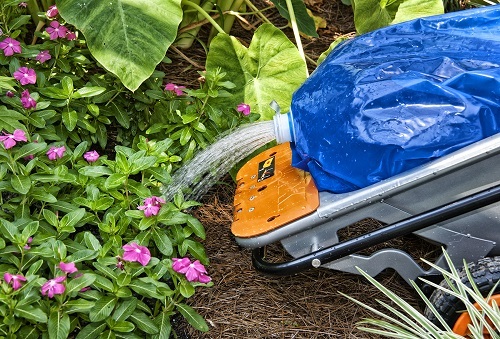 Optional accessories: a Wagon Conversion Kit; Snow Plow Attachment and Watering Bag.